Lone Palm Hotel is set on an elevated piece of land with beautiful landscape and a serene environment which is perfect for guests who desire a relaxing getaway; it is close to the main road. This hotel offers the conveniences and comforts of home and office with staff that are cordial, capable and committed to providing unparalleled service at 45 Ezenie Avenue, off Onitsha- Asaba Express Road, Asaba, Delta, Nigeria. Lone Palm Hotel's rooms are divided into Single, Standard, Royal, Executive, Family Suites and Royal Suites. 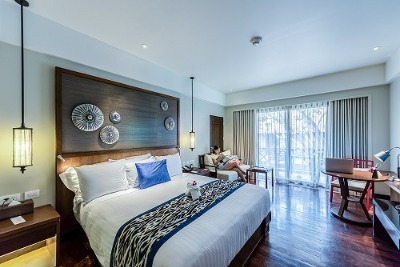 Each room is equipped with amenities such as an air conditioner, TV with satellite reception, private bathroom with bathtub, refrigerator, telephone, work chair and table. Guests can enjoy excellent cuisine in the on-site restaurant or kick back and relax in the fully stocked cocktail bar. Lone Palm Hotel also provides checked-in guest with fast wireless internet services, an express check-in and check-out, laundry services, room service, adequate parking space and security round-the-clock. Q: Does Lone Palm Hotel offer free Wi-Fi? Q: Does Lone Palm Hotel have a swimming pool? Q: Does Lone Palm Hotel offer complimentary breakfast? Q: Is there a fitness centre/gym at Lone Palm Hotel? A: There is no fitness centre/gym at Lone Palm Hotel. Q: Does Lone Palm Hotel have a restaurant? A: It has a restaurant offering fine dining. Q: Does Lone Palm Hotel have on-site parking? Is it free? Q: Does Lone Palm Hotel offer airport pickup or shuttle services? A: No. It does not offer airport pickup/shuttle services. Lone Palm Hotel is an affordable hotel in Asaba, Delta. For one thing, the hotel is quite affordable. This is not to discredit the hotel in any way, my stay was surprisingly awesome. The rooms were sizable, water was steady . I liked my stay. Average, environment was okay but service was not. The extension in my room was not okay and the intercom was faculty I had to walk to the reception whenever I needed something. Nice and very discreet setting, constant power supply, what really did it for me was the quality of the rooms, spent three weeks there and it was a lovely time i had there, thumbs up to the management very caring and willing to help. I only stayed here because it was the closest hotel to where I work, if not I would have look for another hotel. No light they depend fully on inverter and you can’t put on the light. My experience was bad. Have nice pictures of Lone Palm Hotel?